Gluten-free DIY Pizza kit with all the essential ingredients and instructions to allow anyone become an Italian Pizza Chef. The kit (for 2 pizzas) contains the right dose of gluten-free flour, yeast, iodized sea salt, tomato sauce, Calabrian oregano, Italian extra virgin olive oil and... water. Because according to the creators of this kit, water is essential to the success of pizza dough, and it must have the right PH. In order to prepare a traditional pizza at home, you need the best ingredients, an oven and a pinch of attention. 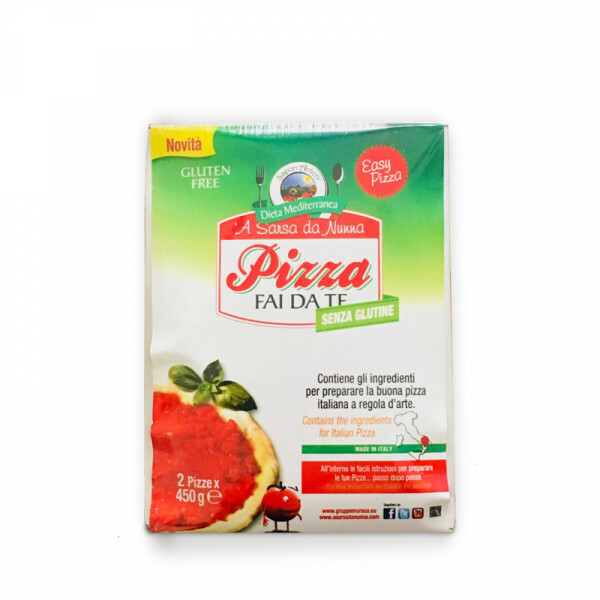 This is a pizza kit with all the required -carefully selected 100% Italian- ingredients. The kit also includes all the necessary instructions to allow anyone become an Italian Pizza Chef. Follow the simple steps to prepare the perfect Italian pizza - tasty, homemade, comfortably at home!